American tariffs on products from China and Europe, and continued negotiation of trade deals with Mexico and Canada have created an unsteady atmosphere in the stock market. An announcement of new tariffs against China in mid-June created day-long volatility in the Dow Jones Industrial Average, which saw a 400-point drop midday on the day of the announcement. The Spectrem Millionaire Investor Confidence Index (SMICI®) and the Spectrem Affluent Investor Confidence Index (SAICI®) reflected the confusion, as the SMICI fell by 1 point and the SAICI dropped by 3 points. The SMICI (an index of investors with $1 million in investable assets) dropped to 7, and has fallen 11 points since February. The SAICI (an index of investors with $500,000 in investable assets) dropped to 3, its lowest point since June of 2017. The SAICI has fallen from 12 to 3 in just three months. The June fielding took place June 15-20, 2018. Both Millionaires and non-Millionaires reported a drop in Stock investing, and the overall percentage fell to 29.20 percent. Millionaires investing in the Stock market fell from 34.1 percent to 30.2 percent in just one month, and reached the second-lowest percentage in the last year. At the same time, Stock Mutual Fund investing increased for both segments to 34.80 percent. Cash Investing among Millionaires rose significantly to 24.5 percent from 20.4 percent. Those Not Investing, meaning investors who are not extending their investment funds further in the coming month, rose to 38.0 percent overall, and among non-Millionaires, 47.8 percent said they were Not Investing in July. That is the highest percentage of non-participation since July of 2017. Both men and women decreased their Stock investing in June, among females, the percentage fell from 30.5 percent to 24.4 percent, the lowest level in three months. 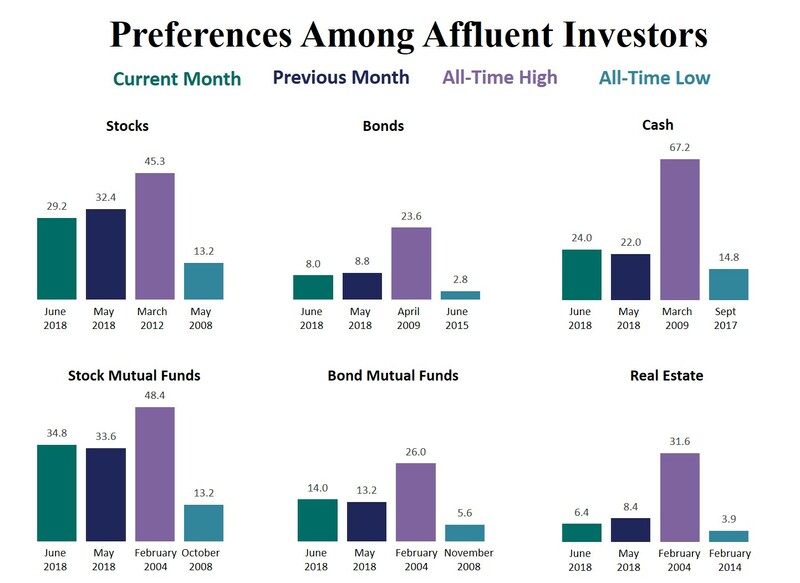 Stock Mutual Fund investing increased for both groups, however. Men also increased their Individual Bond and Bond Mutual Fund investing, while Females increased their Cash investing significantly, to 24.4 percent. Both men and women increased their percentage of those Not Investing in July, meaning those not increasing their investment funding. Among men, the percentage increased 3 points to 36.6 percent. The SAICI and SMICI for females dropped in June, with the SAICI falling back into negative territory at -1, and the SMICI falling from 9 to 2, after seeing an 18-point improvement in May. The SMICI for men bumped up a point to 9 in June, while the SAICI for men fell to 5, the third monthly decrease in that category. Investors who vote Democratic were very positive about investing in June, with increases in nearly every category of investing except Stock investing, and a drop in those Not Investing to 39.47 percent (after 50 percent of Democrats in May said they would not invest further in June). Republican investors saw decreased participation in Stock and Stock Mutual Fund investing, as well as Bond Mutual Fund and Real Estate investing, but their percentage of those not increasing their investments in July fell to 32.94 percent, after a notable increase over the previous two months. The Republican overall indices both dropped to their lowest marks in 2018. At the same time, both indices climbed for Democrats, although the Affluent Index remains in negative territory. Both working and retired investors dropped in Stock and Stock Mutual Fund investing, but both groups saw a rise in Cash and Bond Mutual Fund investing in June. In both cases, the percentage of investors Not Investing rose, and there was a big jump among working investors to 29.6 percent Not Investing. The highest level since February. The SAICI and SMICI both dropped for working investors, and the Millionaire index fell from 19 to 11, the lowest mark of 2018. The Millionaire index among retired investors rose to 2, but the affluent index remained in negative territory at -1.